Little is known about what causes rosacea. An altered immune system, sun sensitivity, neural pathways, and disruption of the normal skin barrier (causing general skin sensitivity) may all be at play. Ocular rosacea, which is rosacea of the eye itself, consist of itching, tearing, dryness, gritty sensation, crusting, inability to wear contact lenses, as well as frequent styes. 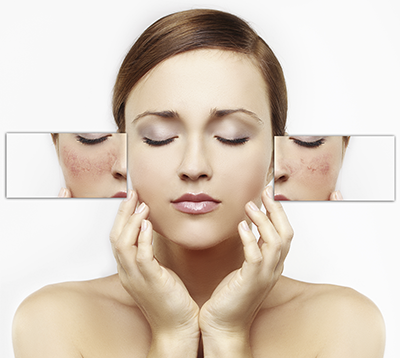 Rosacea is sometimes confused for acne, however these are two distinct conditions. The particular rosacea subtype determines the treatment. Our physicians have extensive experience treating this condition. We offer medical treatments with topical medications and oral therapy, laser such as intense pulsed light, and skin care recommendations. Isotretinoin may be recommended. Wash the face with soap-free, pH-balanced cleansers. Sulfur products may be helpful. Avoid scrubbing or exfoliating; avoid astringents and toners. Apply sunscreen with both UVA and UVB protection (“broadband”) and an SPF ≥30 daily. Titanium dioxide and/or zinc oxide are usually well tolerated. Restore your skin barrier by applying products that will form a protective coating to shield your skin from environmental pollutants. Moisturizers containing humectants (e.g. glycerin) and occlusives (e.g. petrolatum) help to repair the epidermal barrier. Avoid products contain alcohol, menthols, camphor, witch hazel, fragrance, peppermint and eucalyptus oil.